I spent hammers to protect my dungeon and i came back to see my dungeon unprotected. I also jumped from 700 stolen to 1600 in a few minutes. You've depleted my hammers so I know they were spent. Is this because of the event flaw that started this weekend? Please fix. Just ran into this myself. I had no honor stolen so I decided to use some of my hammers and protect my chest. Did a few raids and when I looked again I have now had over half of my honor stolen while my chest is supposed to be protected. I’d like to know what they point of hammers are, or of apparently wasting them when my honor can still be stolen? Someone posted (forgot who) in another thread saying something along the lines that your dungeon gets picked and put into a pool for being raided, and i think due to timing of when you get put into it and when you have your chest locked, it may not line up correctly. The whole hammer/chest protection thing is a really, stupid stupid system. Like, REALLY stupid. So in other words hammers are completely pointless. Got it! They aren't useless, but if your chest is unprotected for any amount of time it can be attacked. When your chest is protected, it cannot appear for other players to raid. However, if other players got your dungeon as a raiding option before you protected your chest, they can still attack you. Not sure I follow. We CAN get attacked when our chest is protected -- losses just don't reduce our daily Honor and gold payouts. If what you're saying is true, why are there 2 defense icons when you click on your chest? One shows your losses while protected, the other shows losses without protection. Apologies, I meant that it cannot appear for other players to raid and you'll lose resources. If your dungeon is shown to another player while it is not protected, it will count as unprotected when they attack you. The game has always worked this way, it is nothing new. Hm....still doens't make sense to me. 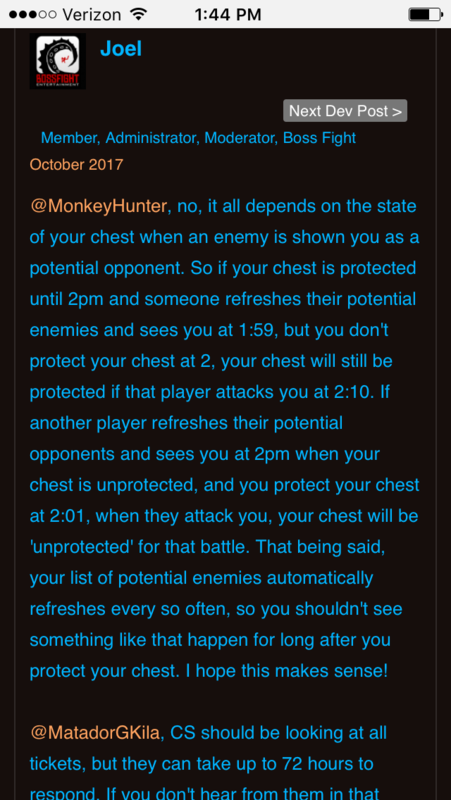 I'm inferring from your post that if your chest is protected, your dungeon won't show up for anyone to raid, which is not true because your chest will show you defense losses when protected and unprotected. Someone else posted this in another thread, but they said your dungeons are selected and put into a pool of dungeons for raiders to see. When selected into the pool of dungeons, if your dungeon wasn't protected at the time of selection, then it won't matter if you protect afterwards, as any defense losses will count as an unprotected loss. This makes the most sense as there have been tons of complaints that chests are protected and then afterwards it shows losses as unprotected. @joel I hope this is not how matchmaking works. It would, however, explain how defense losses clump together and how you can find the same opponent over and over again with raid refreshes. If this is the case, it severely and unnecessarily limits PVP matchmaking. A protected chest should have NO bearing on which teams are seeded. A fix is simple: limit the amount of defense losses to 3 per hour and 10 per day. 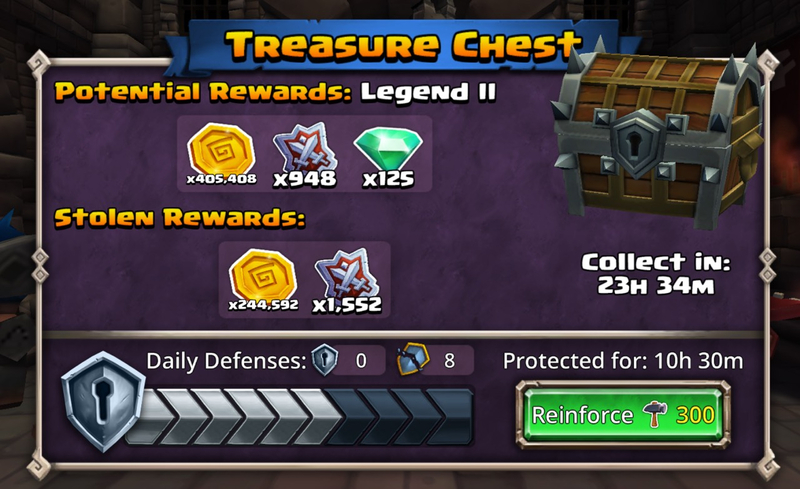 Your dungeon could still be attacked, but if those thresholds are reached no resources (trophies, gold, honor) are lost. I've had it happen where my chest is unprotected, I see that I haven't lost anything, so I use hammers to protect it. An hour later, I see that I lost a few defenses and lost gold/honor as well. As I had no losses at the moment I protected my chest, it feels that those raids should have been protected. I am guessing that there is a terrible lag between when someone raids my dungeon and when the losses are actually applied to my chest - and many losses are all applied at the same time, even if the actual raids took place over time. This lag is confusing and disheartening. If I had known that I had already lost half my honor, I would not have wasted the hammers to protect what was left. I think this is what the original poster is experiencing. In my experience, this earlier explanation is still accurate. @Joel Here are two pics I've been unable to adequately explain. Both are taken about 5 minutes apart. They both show that my chest has been protected for at least about an hour and a half (2 hour increments, next up is 12 hours) and the pics were taken within 30 minutes of chest reset. One pic shows that my new chest lost 1164 honor during the 20 minutes it was protected and 5 minutes later I had lost another 388 honor while still thus protected. 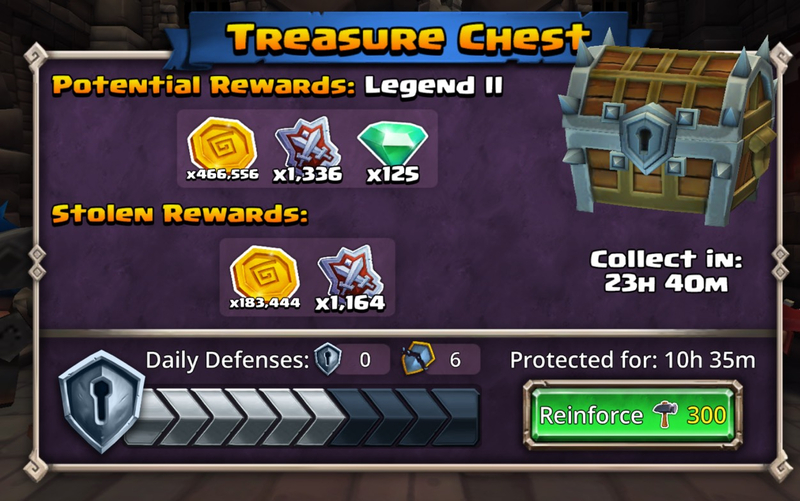 All I can figure is that I had lost the battles before my chest protection began, during the previous 24 hour period, and there was such a delay in the application of the losses, that I protected my chest, collected a chest and almost 30 minutes more expired before DB applied the losses. That's crazy. db has this thing about telling you when raids happen. When my chest gets offered for raiding, everybody jumps on it and I lose a bunch of matches. Usually this happens before the daily reset, because I log onto the game right after reset. I log on, go to my dungeon to collect daily rewards, and see [let's say ] 10 matches with my trophies ticking down [it's very depressing]. Then I leave my dungeon screen, and even if I'm go right back to it, I'll see another 10 losses tick off. This can happen 3-4 times, as it doesn't DL all your losses at once. it's quite possible you're seeing this effect too.